On Oct. 9, 2013, the Juno spacecraft will fly past the Earth for a gravity-assist boost that will slingshot the probe onward to Jupiter, the largest planet in our solar system. A NASA spacecraft bound for Jupiter went into a precautionary safe mode today (Oct. 9), shortly after completing a speed-boosting flyby of Earth. NASA's Juno probe detected an anomalous condition and went into safe mode this afternoon after slingshotting around Earth to gain momentum for the long trip to the solar system's largest planet, according to media reports. While Juno's handlers are still trying to figure out what went wrong and how to fix it, they're hopeful that the problem won't threaten the $1.1 billion mission. "We believe we are on track as planned to Jupiter," Juno project manager Rick Nybakken, of NASA's Jet Propulsion Laboratory in Pasadena, Calif., told the Associated Press. He described his level of concern as "moderate." The Juno mission launched in August 2011 and is slated to arrive at the Jovian system in July 2016. 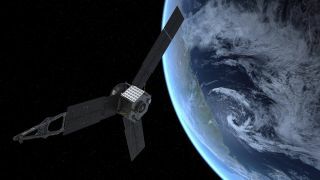 The probe is so heavy — about 8,000 pounds (3,267 kilograms) — that its Atlas 5 rocket couldn't send it all the way to Jupiter by itself, so mission planners devised the Earth flyby to finish the job. The flyby, which was highlighted by a close approach that brought Juno within just 347 miles (558 kilometers) of Earth at 3:21 p.m. EDT (1921 GMT), was designed to boost the probe's speed from 78,000 mph (126,000 km/h) to 87,000 mph (140,000 km/h), mission officials said. Once Juno enters orbit around Jupiter, it will study the gas giant's atmosphere, gravitational field and magnetic field with nine science instruments over the course of a full Earth year. Scientists hope the probe's observations reveal insights about Jupiter's formation, structure and composition, including whether or not the planet possesses a solid core. While the main purpose of today's flyby was to give Juno a speed boost, mission officials also planned to check out the spacecraft's science gear during the maneuver. The Juno team was also planning to take pictures of the Earth-moon system. The probe returned surprisingly little data during the flyby, the AP reported.